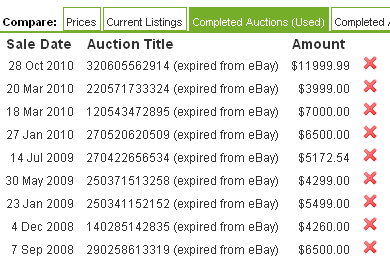 In our previous feature request survey many users asked for more listings in the "Completed Auctions" section of our site. Previously we showed data for the last 6 months and had a 15 sale maximum. Now we show 20 sales as far back as we have data so you can see a more complete sales history. We used to show 0 completed auctions for Nintendo World Championships Gray because the last sale on eBay was almost two years ago. We now show 9 eBay sales going all the way back to 2008. Peek-A-Boo Poker went from 3 listings to 18 listings. DKC Competition increased to 20 listings from 5. Every rare video game will show a much more complete sales history so you can better price your purchases and sales. This change really improves the New Completed Auctions because they are so much more rare than used games. Contra improved to 20 listings, Earthbound shows 10 times more new listings, and Chrono Trigger shows 20 new sales. For rare games we show a much longer time span than eBay or any other sources. We have plans to add features which allow you to click a "Show more" link that will add another 20 sales. You can keep clicking this link to see a history as far back as you want. Listings that are no longer showing on eBay have the message "Expired from eBay" instead of showing the listing's title. In our next update we will change this to use the title stored in our database instead of grabbing the data from eBay. This way you can read the titles of listings that are years old.